May 14, 2015 May 14, 2015 Nefer Khepri, Ph. D.
Free Reading for May 14, 2015. 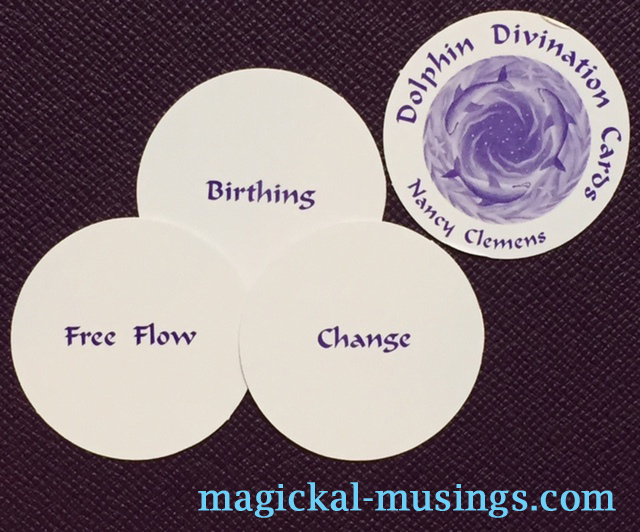 The messages received from The Dolphin Divination Cards by Nancy Clemens are always very simple. They are open to interpretation using your own intuition and even kids can use them with great effectiveness (see my review of this deck here). The Dolphin Divination Cards, by Nancy Clemens (C) Blue Dolphin Publishing, 1993. Here, we are being told that the Free Flow of ideas, thoughts, and actions is what is called for today. Remain open. Try not to isolate yourself. Consider all things. This approach will result in Birthing, which is bringing something new into the world; whether this is an idea for a new project, a new method for doing something, or a new approach to a problem. Birthing indicates newness. New things entering our lives always lead to change, and change is positive.